made in Sweden - Where else! Sparkle & Pearloid - 1958-1963 "The early days"
In the beginig there was only accordions! From january 1925 until the summer of 1958 the main business of the Hagstrom company was based on accordions. 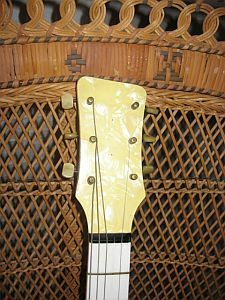 There was some acoustic guitars produced in Oslo, Norway and a couple of Hawaiian lap steel guitars built in Falun, Sweden in the late 1940's. After a journey to the US in 1958 Albin Hagström's oldest son Karl Erik Hagström came back to Sweden stating that the accordion era was comming towards an end and that the future was rock´n´roll and that Rock music demanded electric guitars insted of accordions! 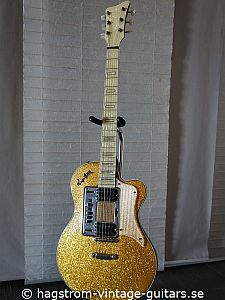 After some research, witch included taking a Gibson Les Paul "Goldtop" apart (Hagstrom was the Scandinavian Gibson distributor at that time), the head designer Holger Berglund and his right hand man Arne Hårdén started to design the first Hagstrom electric guitar. 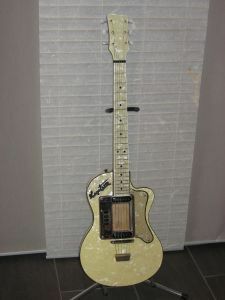 During the end of 1958 there was a pre-production batch of guitars built. Those instruments probably have their serial numbers stamped in their perloid covered bodys starting from P-001. 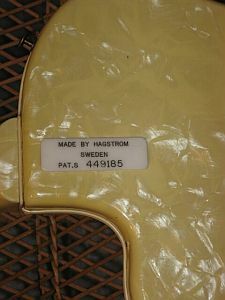 The first "official" batch of Hagstrom electric guitars is batch 449. 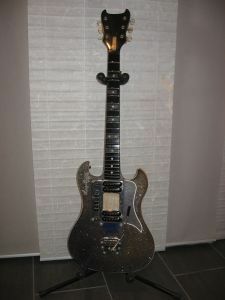 The first part of this batch is Hagstrom De Luxe "small model" and the last part is the "large model" witch later became the Hagstrom De Luxe 90. In this first batch there was 200 guitars built from 1958 to 1959. 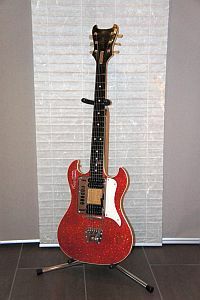 The last batch of Sparkle & Pearloid guitars was batch 540 built in 1963. 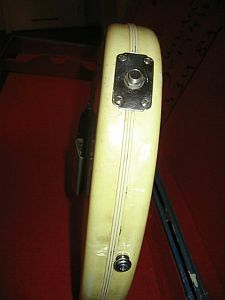 De Luxe "smal model", 1958-1959. 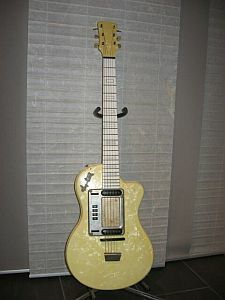 Basically this is the same model that later became the Standard 80. One big differes is that "the small model" had the binding on the middle of the side of the body. Known colors: white perloid plastic. 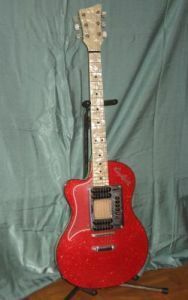 Standard "Sweetone", 1959 (probably the same type of guitar as the Standard 80). 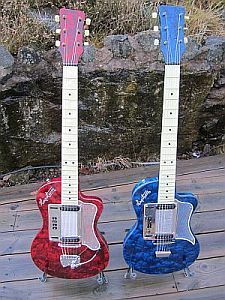 Some "Sweetone" guitars have other colors than the white perloid. Known colors: white, red and blue perloid plastic, mahogany front with white perloid plastic back and sides, white pearloid front with blue pearloid sides, back and neck! Standard 80, 1959-1962. 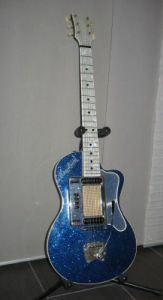 The most common of the Sparkle & Pearloid guitars. 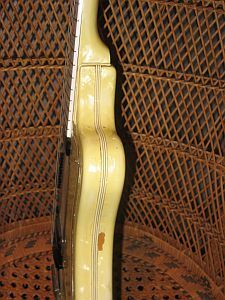 The finish with white perloid body and neck or white body with black neck. 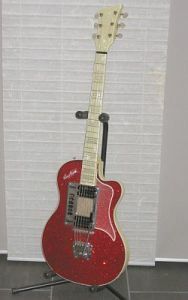 The Standard 80 was built with or without the Hagstrom Tremar tremolosystem. 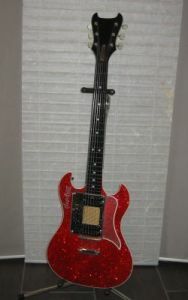 Known colors white perloid plastic, red and blue sparkle front, all black body and neck, mahogany front. Goya 80, export USA, 1960-1962. Same specifications as the Standard 80. 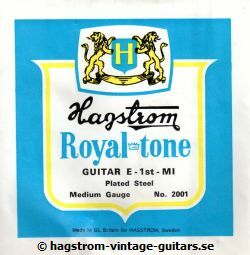 The US distributor of Hagstrom considered Hagström to be a hard-to-sell brand name on the US market and therefor used the name Goya insted. Due to the fact that the custom fees were lower on acoustic, or in this case non electric guitars, most of the guitars were delivered without electronics and then assembled in the US. There was four different electronic units to chose from, P-12, P-24,and P26. Known colors white perloid plastic, red, blue, gold and champagne sparkle front, all black body and neck, mahogany front. 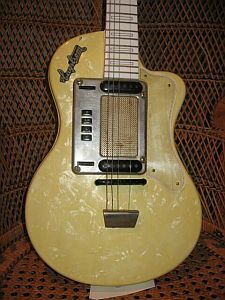 De Luxe 90, 1959-1962. 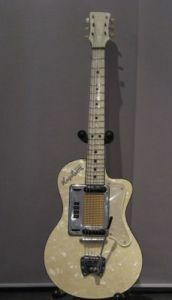 Probably the very first De Luxe 90 guitras were those named "Big model" in the last part of the first official produced batch, 449 from 1958-1959. 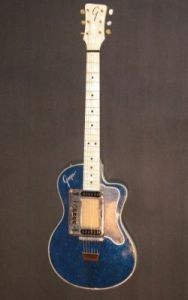 Known colors: red, blue (some turns more to purple than blue), gold and sea foam green sparkle front, all black body and neck, mahogany front. Goya 90, export USA, 1960-1962. Same specifications as the De Luxe 90, the rest of the story is the sama as for the Goya 80 above. Known colors: red, blue, gold and champagne sparkle front, all black body and neck, mahogany front. De Lux "Batman", 1962-1963. Also nick named "Duck's foot". 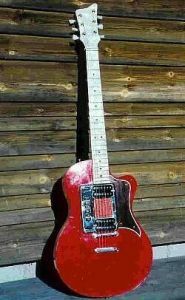 This is the only guitar designed by Karl Erik Hagstrom himself. 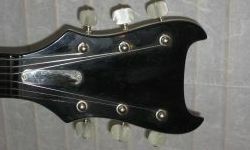 The Batman has set neck and came with or without Tremar tremolo. Known colors: red, blue (some turns more to purple than blue) sparkle front, all black body and neck. 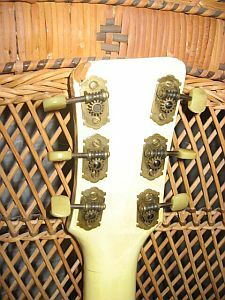 Body and neck in birch, acrylic fretboard, celluloid covered body and back of neck/head. 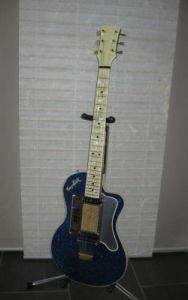 22 frets and 615mm (23 1/4 inches) scale length, set neck, P-46 pickup unit. P-001 - P-999 made in 1958. 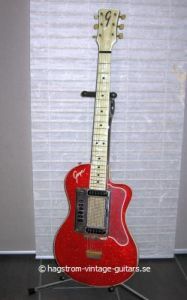 The first Hagstrom guitars sold in the US was branded Goya instead of Hagström. 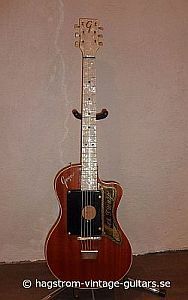 The first Hagstrom guitars sold in the US was branded Goya instead of Hagström. 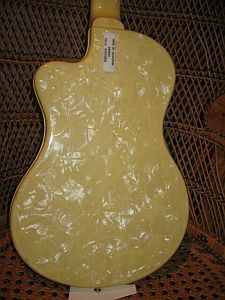 They where exported to the US as "non electric" guitars as the custom fees was lower on acoustic guitars. 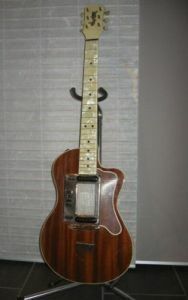 The pickup units was sold separately and added to the guitars in the shop according to the customers preference. This guitar (#465020)was never "electrified"
Serial # 466250, one of very few known! There were proboably only two "left" sparkles ever built. Serial # 488121, with tremar unit. Black wasn't the most common finish. 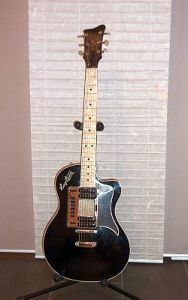 One of the rare Batman guitars, this one in "mint" condition! 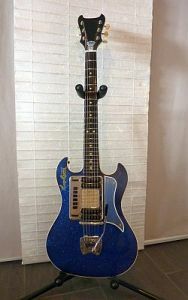 A rare Batman guitar from second and last batch.